As always, Dragon began her journey atop the Falcon 9 rocket. Launch from KSC’s 39A occurred last month, via an issue free ascent – carried to orbit by the Second Stage, while the booster made another successful return to LZ-1. As the time it was the 6th Falcon 9 RTLS landing and the 14th overall successful landing of the Falcon 9 first stage. 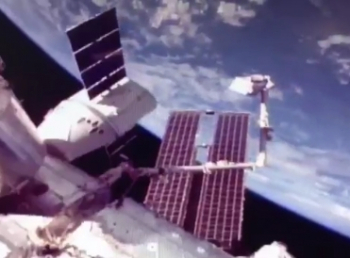 The primary goal of the mission saw Dragon stalk the ISS prior to her arrival for berthing. Grabbed by the Space Station Remote Manipulator System (SSRMS), Jack Fischer and Paolo Nespoli carefully translated Dragon to its pre-install position 3.5 m away from Node-2 Harmony’s nadir port. This marked the official arrival of 2,910 kilograms (6,415 pounds) of cargo to the station. This included 1,652 kilograms (3,642 lb) of pressurized cargo and the 1,258-kilogram (2,773 lb) ISS Cosmic Ray Energetics and Mass (ISS-CREAM) instrument which was carried in Dragon’s Trunk. ISS-CREAM was removed from the Trunk by the SSRMS and handed over to its robotic colleague the Japanese Robotic Arm (JEM-RMS) via the work of the ground controllers. It was then installed on the Kibo module’s Exposed Facility (JEM-EF) for a three-year investigation, is intended to monitor extremely-high-energy cosmic rays, measuring their charge and energy. The SSRMS then moved into operations to prepare for the departure of Dragon as the ISS crew filled the vehicle with its downmass. The ISS crew also checked out the vital communication system that will be employed during the departure of Dragon. “Commercial “Off-The-Shelf (COTS) Ultra High Frequency (UHF) Communication Unit (CUCU) and Crew Command Panel (CCP) Checkout: In preparation for the upcoming SpaceX-12 unberth and release, the crew coordinated with ground teams to activate the CUCU System and performed a successful checkout of CCP serial number 3,” added the status information. 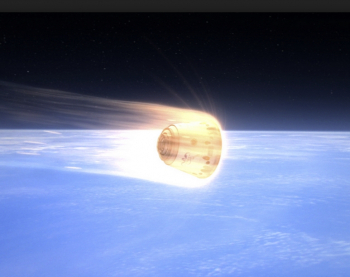 Saturday marked the unberthing of the vehicle from Node 2. 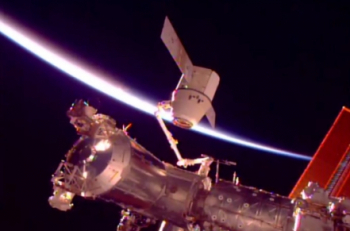 The Station crew then maneuvered Dragon on the end of the SSRMS away from the main structure of the ISS to its release point 10 meters from the orbital lab. Expedition 53 Flight Engineer Paolo Nespoli of ESA (European Space Agency) with the assistance of station Commander Randy Bresnik of NASA – working in the Cupola lab of the ISS – commanded the release of the LEE snares holding the spacecraft. The exact time of release is always subject to change from the announced plan due to lighting conditions, communications coverage, and day-of timeline activities. CRS-12’s release was marked as at 4:40 AM Eastern. 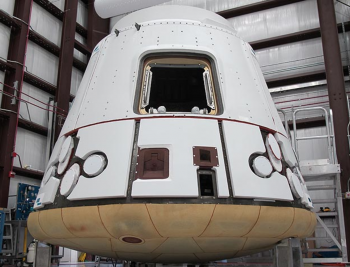 During the initial stage of departure, Dragon will be under the control of its own computer programming, with the Station crew and controllers at Mission Control Houston in Texas for NASA having primary control over the spacecraft. 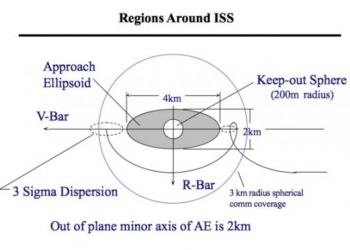 As Dragon pushes down the R-Bar, the largest of the three thruster departure burns will impart enough Delta Velocity (Delta-V) change to Dragon to push it outside of the approach ellipsoid. Dragon then reoriented, with its heat shield out in front in preparation for Entry Interface (EI) – the moment Dragon reached the first traces of Earth’s upper atmosphere. 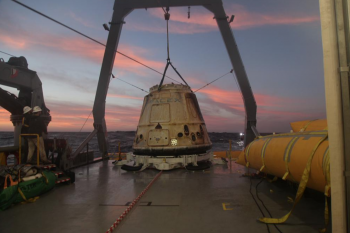 Recovery was attained by three main recovery vessels which were positioned near Dragon’s return location. Once safely aboard the recovery vessel, Dragon was transported to the Port of Los Angeles and will then shipped to Texas for cargo removal. 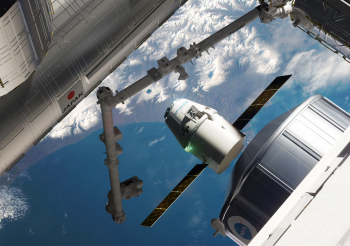 Under the second Commercial Resupply Services (CRS-2) contract award, Sierra Nevada’s Dream Chaser spaceplane will join Dragon as only the second uncrewed vehicle capable of returning equipment and experiments from the Station. 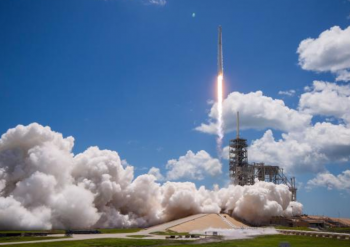 With the conclusion of CRS-12, NASA’s next commercial resupply mission to the International Space Station will be SpaceX’s CRS-13 flight, which is currently targeting liftoff from LC-39A at the Kennedy Space Center in December.